Here is a plate of my No Work Tuna Spaghetti. This is the perfect type of lazy day summer dinner that requires only a minimum of effort to keep you near that hot stove. At the same time, this is also one of my favorite recipes all year long since it is easy to prepare, healthy, and does not involve too much time when you are busy. You will be surprised at how the addition of mustard takes away the strong taste of tuna and changes the flavor into something more like a clam. Usually I like to make my own homemade pasta dough. However, I do resort to store bought on occasion when I’m short of time. You can make my dough recipe as I shared with you in an early post or use a one pound box. Both methods will work well, but I will be honest that homemade pasta does taste better and I am spoiled when it comes to fresh pasta and homemade bread and do prefer making my own. The only real work in this recipe involves peeling lots of garlic. If you hate garlic, you can substitute onion or use equal parts of both. I made this countless times both ways, but usually prefer the garlic version best. You can use Dijon mustard or prepared yellow mustard. Both taste equally delicious in this recipe, only the prepared mustard version is slightly sweeter and cheaper. Save about two tablespoons of your boiled water that you cooked your spaghetti in to add to your sauce. This helps thicken it up slightly. I do hope you will try this recipe out because it is delicious, easy, and economical. Trust me, but you can fool even tuna haters with the incredible flavor of this dish. They just might think they are dining on clam! Clean and peel your garlic or onion or both and chop fine. Brown your garlic pieces in the olive oil in your skillet until golden, then stir in your mustard, tuna, margarine, lemon juice, pepper, water, and salt for your sauce. When cooked through throw over your cooked spaghetti and blend. 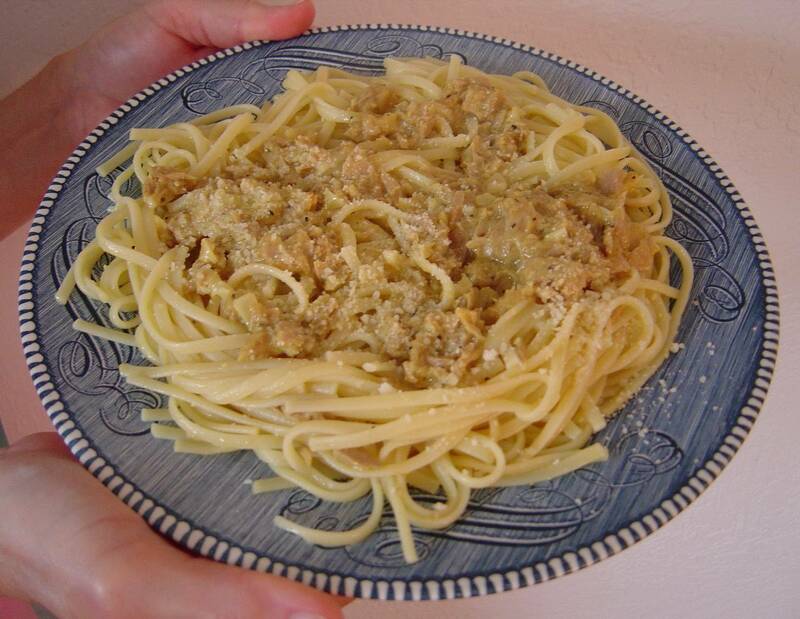 Top with grated Parmesan or Romano cheese and enjoy!